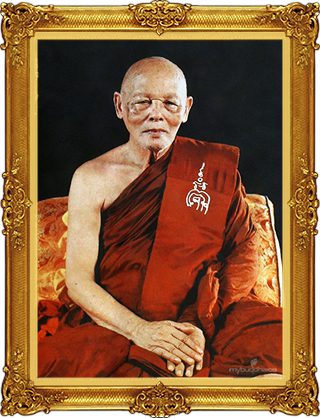 Luang Phor Pae was born on 1 Jan 1905 (BE 2448). When he was 8 months old, his mum passed away and Luang Phor Pae was adopted by his father's younger brother. At age 14, his foster parents sent him with a senior monk at Wat Chanasongkram in Bangkok to studies in Buddhism. In 1927-28, Luang Phor Pae became a teacher teaching Pali at Wat Chanasongkram. In 1931 (BE 2474), Chao Awat of Wat Pikul Thong left his position and wanted Luang Phor Pae to take over the position. Luang Phor Pae became Chao Awat of Wat Pikul Thong and he was only 26 years old. In 1971 (BE 2514) Luang Phor Pae went to India to pay respect to Buddha and the people who helped in the rebuilt of the Ubosot. In 1973 (BE 2516) A Huge Buddha statue was built at Wat Pikul Thong. Also, Luang Phor Pae helped rebuilt and built new temples, schools and hospitals. In 1996 (BE 2539) - He was given a new title "Phra Thum Muni" by the King 50 years accessation to the throne and only 59 monks were invited to be royally given the new title. Luang Phor Pae is well respected monk and his amulets in the region. He passed away in 1999 (BE 2542) at age of 94.